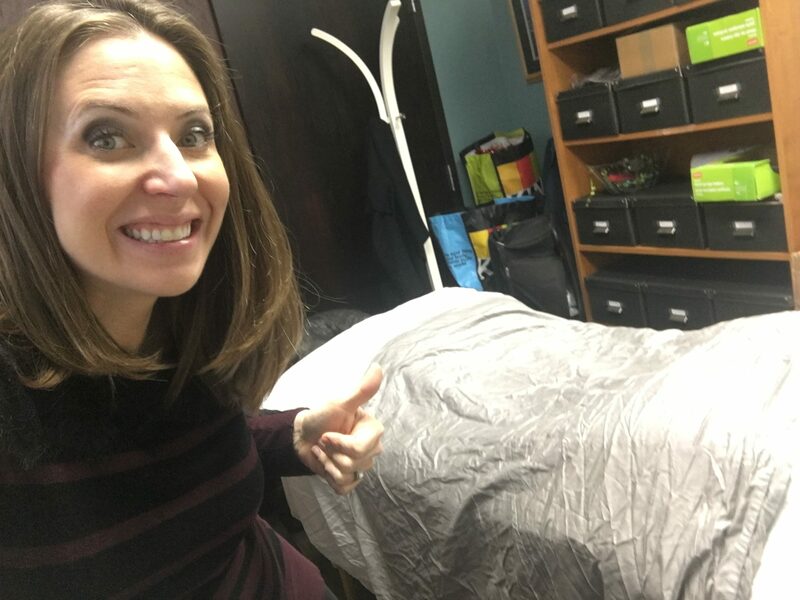 I read the recent story we did in Cincy Chic about Zeel, an on-demand massage service now available in Cincinnati through a free app, so I decided to check it out for myself. At 9 months pregnant, everything hurts right now, so a massage sounds amazing. But with two kids and a husband with a weird schedule (he has to be at work really early so he goes to bed at 6pm and gets up at 1am), getting out of the house for a massage at a spa is getting increasingly more difficult. Knowing I was going to have a long day at work the other day, I decided to download the Zeel app and see if I could get a massage therapist to come on my lunch break. It was super easy — you just put in some basic info about yourself, and then select the day, time, location (office, home, friend’s house, etc), type of massage (deep tissue, prenatal, couples, etc) and gender preference for your massage therapist and then you confirm it. It took about 15 minutes and then I got a notification that a massage therapist had been booked, gave me her name, and some details to prepare my space for the massage. Easy peasy. A few minutes later, I got a text from my massage therapist introducing herself and giving me her contact info in case I needed to reach her for anything prior to the massage, and also letting me know when she’d be there to start setting up the room for my massage. Come lunchtime, my therapist arrived, I got an amazing massage and felt like a new woman for the rest of the day. It was seriously awesome. Plus, I really liked that the tip and everything is included in the original booking price that you pay through the app, so there’s no trying to awkwardly find cash at the end of your massage. I actually just ordered another Zeel massage a couple nights ago to my house — after the hubby went to sleep and I got the girls down for bed, my massage therapist arrived and I got another amazing massage. I feel like I’ve cracked some mom code where I figured out how to get my beloved (and much-needed) spa days back! haha! Highly recommended! To learn more about Zeel Massage, visit https://www.zeel.com or you can download the app in your phone’s App Store. You can also use code CINCINNATI for $20 off your first massage. A little over a month ago I went to Becoming Mom Spa + Ultrasound to get a manicure and pedi before an event. 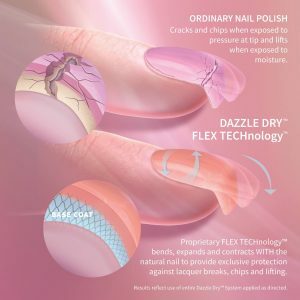 I’ve been going for years and they have always had their pregnancy-safe polishes, but they never offered any type of “shellac” or gel nails because there weren’t any out there that were pregnancy safe… until now! They now offer Dazzle Dry, which is like a shellac or gel nail polish that is SUPER long lasting (my finger nails lasted two weeks and toe nail polish is still going strong after 5 weeks), without all the chemicals that traditional shellac/gel products have — good for you, pregnant or not. It dries after just a few minutes so you can put your shoes or boots right back on and not have to worry about smudges! Check it out for yourself at Becoming Mom! They’re in the Deerfield Towne Center in Mason, and there’s a new location opening soon in NKY! So exciting! I started using EVER’s Lavish cream last year to get rid of my stretch marks and couldn’t BELIEVE the results. So I looked into what else they had to help with some other issues I was having. Ever since I was a teenager, I’ve always had acneic skin and breakouts on my face, and now that I’m not exactly a teenager any more (more like an always tired Mom of two going on three soon) I’m also starting to see fine lines, wrinkles, uneven skin tone and texture. I thought I needed to use all the super strength products to keep the acne and aging at bay, but even those products weren’t working well AND I was putting a bunch of chemically, not-good-for-you stuff on my skin. So when I got pregnant with baby number three at the end of last year, I decided it was time to maybe give EVER facial skincare a try. Their good-for-you, botanical ingredients worked BIG TIME on my belly so why not my face? And boy was I pleasantly surprised. As you can see my skin is a lot less inflamed now and this is only using it for a month! It looks and FEELS like it’s getting healthier. And that’s because it actually is. What I love about EVER is that they’re all about Safety AND Efficacy. They keep out any harmful chemicals that’ve been banned outside of the US or are known to be linked to health concerns. They call it the “Never EVER” list. Their products are safe to use during pregnancy and nursing and even on children! But don’t mistake this more natural approach for lackluster results. These powerful botanicals helped with a lot of my skin issues I know a lot of other people deal with too, like uneven skin tone and texture, dark spots, breakouts, redness, as well as fine lines and wrinkles. So here’s what I tried. I went online and filled out a little survey for them to get to know my skin and what I needed help with. Then it developed this personalized plan for me, click, ship and it was on my doorstep in a few days. The Pure Results Regimen has four simple steps to better skin. Completely customizeable based on your skin type. Cleanse, Exfoliate (which by the way, this REVEAL product won the Allure Best of Beauty), Treat and Moisturize. You get 2 different moisturizers, one for AM with mineral SPF 32 that comes in beautiful tinted shades or clear and one for PM. The products smell amazing and are luxurious like a spa experience. Beautiful packaging – looks great on your bathroom counter. Lasts a long time too. And when you bundle all these goodies in their Regimen package, you actually are saving 20% off the retail price of purchasing the products individually. You can take the free Skin Quiz I did to figure out which products are right for your skin type, and then you can go from there! If you do decide to get anything, I know that all new customers can use this link — https://www.talkable.com/x/giU3Lt — to get $10 off their first purchase, so definitely grab that first if you plan to get anything! Punch & Prettification March 15 at Myrtle’s Punch House! We’re teaming up with Myrtle’s Punch House and EVER Skin Care with Andie Wafzig to bring you Punch & Prettification on March 15! I’m so excited to be working with two of my good friends, Andie and Molly, on this super fun event. Both of these amazing ladies believe in using the best, natural, and good-for-you ingredients. Actually, many people don’t know this but Molly hand-makes a lot of her own syrups and mixers for her cocktails to keep them as fresh and preservative free as possible. And my gal Andie is all about “results come naturally” natural but SUPER effective, good-for-you skincare. And if you don’t believe that natural skincare can do the job, just check out these before and after results on my stretch marks! A video on my facial products is coming soon and it’s just as wowing. Seriously, you’ll want to check this stuff out for yourself, and you can in-person, with a fun cocktail in hand, at this awesome event! Our Editor-in-Chic and her BFF head to ALBA Beauty Studio for a mani and pedi session! Keep watching to hear more about their fun girls day out! Learn more at http://www.albabeautystudio.com/. Looking for that Hollywood glow all the celebs are sporting these days? Look no further when you visit Victory Wellness & Medspa’s Halo. According to Dr. Kerschner, owner of Victory Wellness & Medspa, Halo is a different kind of laser. Each treatment takes about 15 minutes to do. Dr. Kerschner and her team will put some numbing cream on your face before starting the session. Dr. Kerschner says that following a Halo treatment you can expect to look a little sunburnt for as many as 3 days, depending on how deep you go during your treatment. There is minimal discomfort and you can put makeup on your face to cover up some of the redness. Victory Wellness & Medspa is the only medspa in Cincinnati that owns Halo. “We definitely welcome you to come by and experience a beautiful face, improved skin, increased collagen, better elasticity, and less wrinkles,” says Dr. Kerschner. Learn more about Halo by visiting victorywellness.com or by calling 513-936-3065. I booked a little mini spa day at Alba Organic Beauty Studio because I heard that they have a bunch of new services and products that I wanted to try out. They now have microdermabrasion, dermaplaning and a whole new line of organic peels for facials — like a Fruit Peel, Botanical peel, and a Yogurt Power Peel. I opted for the Microdermabrasion because I felt like my skin was looking dull after summer – I wanted to slough it all off and feel fresh faces for fall. A Microdermabrasion is a facial procedure that uses manual exfoliation to remove the outer layer of skin. This process works in a series to achieve the best results — so, Benny my esthetician, cleaned, used the microdermabrasion machine, then extracted, then cleaned some more, then moisturized and gave me the most relaxing head, hand and neck massage ever. Overall, Microdermabrasion reduces the appearance of wrinkles, removes acne scars, clears up blackheads, minimizes the size of the pores, reduces sun damage, and evens out your skin tone. It also helps to boost collagen production to provide firming and toning to your complexion! It’s not painful at all, very relaxing. And you know when you get it at Alba, that it’s going to be all organic and good for you! Highly recommended! Learn more about Alba and their services at www.albabeautystudio.com. I told you about my friend Gina Johnson who introduced me to NYR Organic a few months ago, and I’ve been loving their products (their foaming bath and body oil are so dreamy!) I’ve been looking into possibly switching over some of my lotions and cosmetics to NYR, but I was confused when I started comparing. Some of my lotions say they’re “all natural” or even “organic” … what’s that mean? Which is better? I just want to know that what I’m putting on myself and my family is safe. That’s why I love that NYR Organic just recently stepped it up a notch and got a third party involved to verify the safety and purity of some of their products. Currently, five of the NYR Organic products are now “Made Safe” certified with more products undergoing the certification process as we speak. I know that definitely helped me when I was comparing to know that a third party was fact checking the ingredients and putting their “Made Safe” stamp on things! If you haven’t checked out NYR Organic, definitely go online and learn more about them and look through their online store. They’ve been leading the way in organic since 1981… before organic was even “cool”! ?? It’s actually the #1 selling skincare in the UK and Japan! Like I mentioned, I love their foaming bath and body oil, and I’m about to start trying out their baby line because it’s winning all kinds of awards! I’ll check back in with you in a couple months to let you know how it is! In the meantime, feel free to call or email (her contact info is at the top of this page) my friend Gina if you have any questions or want to try anything out! Sparkle & Sun July 9! Ladies, get ready because Sparkle and Sun is coming July 9th to the Oasis Conference Center in Loveland, which is actually a quick 25 minutes from downtown. And trust me, this is an event you won’t want to miss out on. Co-hosted by Cincy Chic and Sparkle for Good, this shopping event is going to pamper you from head to toe and fill your wardrobe with lots of fabulous finds! If you’re in need of a relaxing day with your girlfriends, Sparkle and Sun is the place to be. Enjoy pampering services and LOTS of shopping with local businesses, makers and artisans with one-of-a-kind offerings all under one roof! Personal services will be a huge part of the event, too. These services are for women by women and are here to help make your life easier, add a touch of elegance, and help you feel your absolute best. Some of these services include photographers, interior designers, florists, life coaches, and personal stylists- just to name a few. Different speakers will also be there to hold mini-workshops on topics like nutrition, fitness, and tips for returning to a career if you’ve taken time away – and the fun doesn’t stop there. Raffle tickets for prizes will be plentiful and proceeds go to Dress for Success Cincinnati. 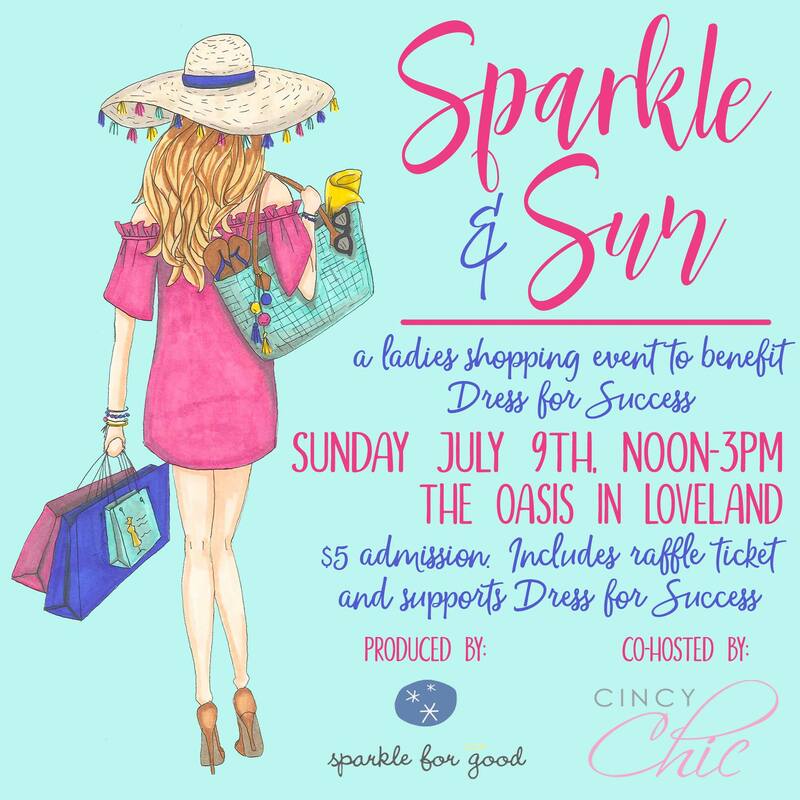 Stop by Sparkle and Sun on July 9th from 12-3 pm at the Oasis in Loveland for the perfect escape! Admission is $5, which includes your raffle ticket. The event will be sure to give you an oasis of chic fun while getting you energized — looking and feeling good — for the busy season ahead! Click here to see the Facebook event listing and share with your friends!